HOLIDAY in Black Leather: Pedag’s bestselling, 3/4 length, vegetable tanned leather orthotic support. Holiday is a light, thin, semi-rigid footbed with metatarsal pad, semi-rigid longitudinal arch support and a soft heel cushion pad. Holiday is ideal for shoes with limited toe room. Awarded the American Podiatric Medical Association (APMA) Seal of Acceptance. Listen to Todd Weiner, Atlanta Falcons Offensive Tackle: �I first used Pedag insoles in my cleats during OTA’s (Organized Team Activities) and throughout training camp. Being 6’4″ and 314 pounds, my feet take a beating on the field, and after using the insoles my entire lower body is less fatigued and sore than it has been in the past 8 years of my career. I will continue to use the Pedag insoles throughout the remainder of my NFL career.” Pedag merges 3 elements: Nature, Science and Technology to produce products that are good for the modern foot. Nature is found in Pedag’s use of high quality natural materials such as vegetable tanned leather, pure cotton, wool, sisal, water based adhesives and active carbon and silver ions for odor control. Science is found in Pedag’s use of supportive, anatomically correct footbeds and inserts that support the arches, muscles and ligaments of the foot. 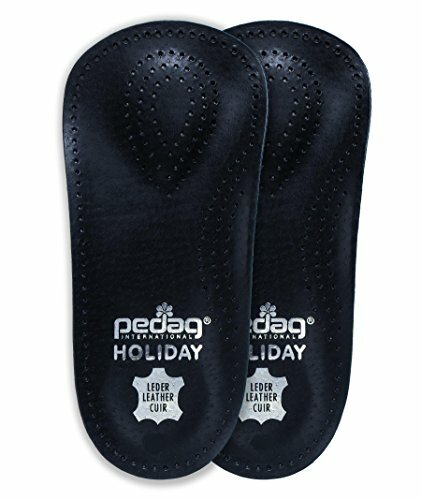 Pedag insoles (orthotic or plain) allow the foot to breathe inside the shoe, keeping feet and shoes fresh. Did you know the foot produces a shot glass of perspiration daily. Insoles that absorb moisture, breathe and prevent odor are necessary for healthy feet. Technology is found in Pedag’s modern manufacturing facilities in Germany (even though much of the production of our insoles is still done by hand), stringent quality controls and introduction of cutting edge technologies such as nano ions of silver for permanent odor prevention in several of our insoles and an innovative new material to insulate against cold.